Do you have a passion for education and a desire to help govern a public school district? Have you always thought of running in municipal politics? 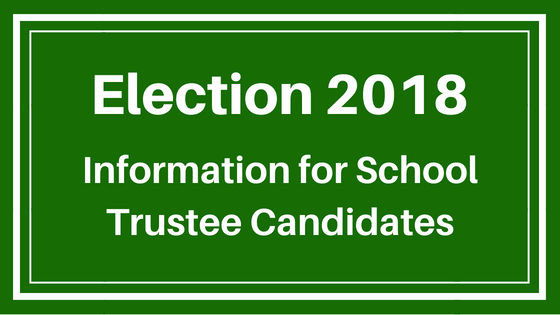 If so, you might want to consider running in the October 2018 municipal election as a School Trustee Candidate! What does a School Trustee do? School trustees are the members of the school district’s Board of Education. They are locally-elected representatives of the public and they are the community’s advocates for public education in their local school district. They are required to carry out their responsibilities in a manner that assists the board in fulfilling its duties under the School Act. The 2018 School Trustee Election will take place on Saturday, October 20, 2018 from 8:00 am to 8:00 pm. For a list of voting places, as well as Advance Voting information, please click on the link below. The BC School Trustees Association (BCSTA) has put together a great guide for anyone interested in running (or running again) for trustee. Please take some time to download the information and explore their website. You can also find more information on the general election timelines on the Elections BC website.